Seattle, WA. | An 88-year old male shot a 51-year old man on a King County Metro transit bus on Saturday, January 26, 2019, around 1115 hours PST this morning, Seattle Police say. It appears there was some kind of disturbance between the two individuals on a bus located on 4th Avenue South and South Walker in Seattle. Eyewitnesses reported seeing the younger man push the older gentleman as he attempted to board the bus, prompting the elderly man to present a gun and shoot the other man. The older man did fall striking his head on the stairwell as he attempted to exit the bus. Both were held by Seattle Police until Seattle Fire arrived to take both persons to Seattle’s Harborview Medical Center. Detectives were dispatched to the crime scene and are currently investigating. The Seattle Police Violent Crimes unit is looking for anyone who has information to aid them with their ongoing case to contact them at 206-233-5000. Both injuries are considered to be of serious in nature. No other passengers on the bus were injured. We can also be found on Twitter & Facebook at @nwfireblog. 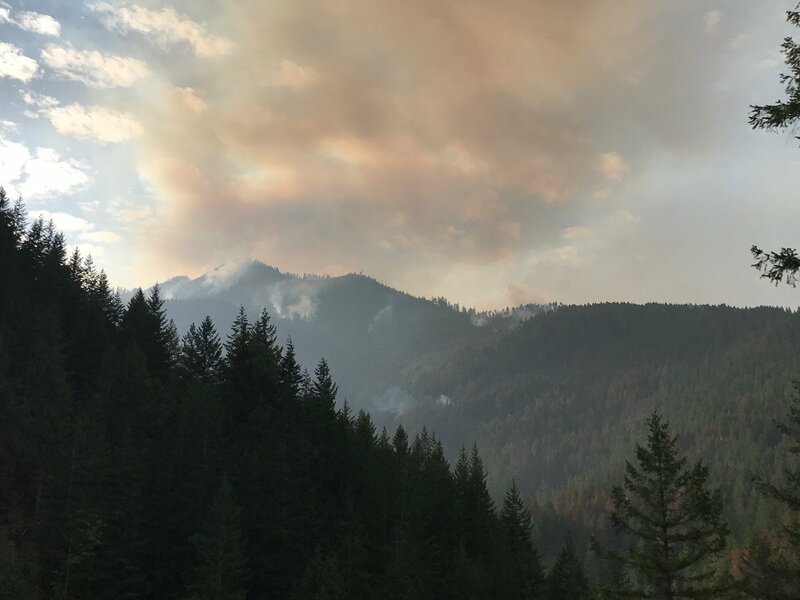 The COUGAR CREEK FIRE is burning approximately 20 miles northwest of Entiat, about 12 miles northwest of Ardenvoir and 7.5 miles of Plain, Washington. The fire started by lightning. Along with the COUGAR CREEK FIRE, the IC is also managing the LOST FIRE and BANNOCK LAKES FIRE. 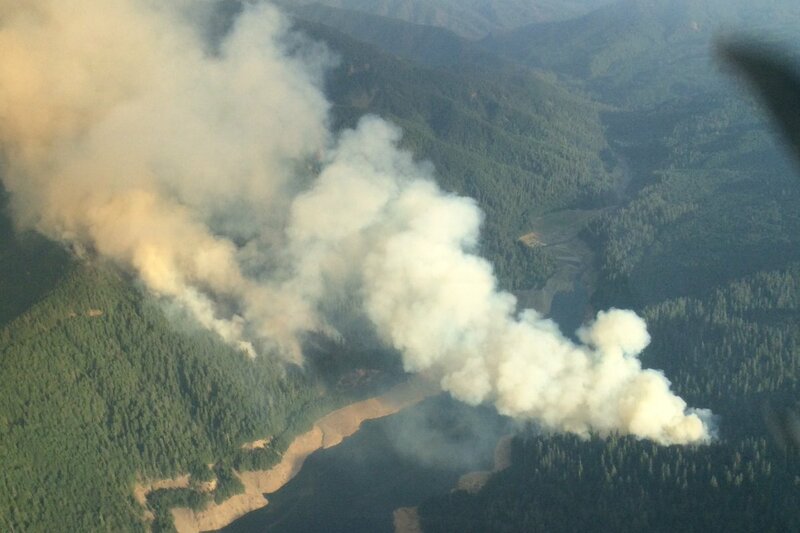 The LOST FIRE is located about 10 miles north of Plain, Washington. The 80-acre fire has been fully contained and is being monitored by air. The BANNOCK LAKES FIRE is located about 177 miles west of Stehekin in the Glacier Peaks Wilderness. This fire is burning among large rocky outcroppings and isolated clusters of timber in steep and inaccessible terrain. The fire is currently not staffed and is also being monitored by air. The fires are burning on the Okanogan-Wenatchee National Forest, Washington State Department of Natural Resources and private lands. There are currently 297 fire personnel assigned along with 7 crews and 13 engines. The NW IMT Team 10 with IC Alan Lawson will relinquish command to all three wildfires to a local Type 3 Team at 1800 hours PDT this evening. The Incident Command Post or also known as the ICP is located at the Leavenworth Fish Hatchery. About 42,712 acres have been destroyed and crews have reached a 79% containment status. Fire suppression and containment costs have exploded up to $42.3 Million. A wildfire named the IRON EAST FIRE was started around 2200 hours by lightning that sparked two fires in the Blewett Pass area on Friday. Level 2 evacuations are still in effect for structures .5 to the northeast of the fire with Hwy 97 still closed all week to enable WSDOT workers to install culverts. The required types and number of crews all have arrived and can now safely work on both fire lines. They have been tasked with prepping on both fires with improving line, installing hose lays, chipping removed brush and getting ready to remove fuels through burnout operations. Air resources are still working to cool both fires and slow forward spread of the fire. A Type 1 Helicopter will be assigned solely to this fire today working on the western side of the fires. Weather is expected to be cooler in the 50’s with a moisture in the air for the next four days. This will allow crews to suppress and contain both fires with weather supporting them. A wildfire named the IRON EAST FIRE was started around 2200 hours by lightning that started two fires in the Blewett Pass area. About 32 acres are burning to the east of Forest Service Rd 9714 and eight acres to the west of FS Rd 9714. Level 2 evacuations were issued for homes about .5 miles north of the fire. Engines were dispatched to the area neighborhoods for structure protection. A VLAT (very large air tanker), a heavy tanker and helicopters were dropping retardant over the fire line. Water was also being implemented to slow the fire’s forward spread. Dozers were used to improve the overgrown roadways on the eastern side of the fire. Hand crews drove over one-hour and hiked 1.5 hours to the fire line. Some of the crews would be “spiking out” overnight to lessen their response time. There are about 283 firefighters assigned to this fire with more due to arrive. All fire suppression gear which include hoses and valves/nozzles etc. will be delivered by helicopter. Highway 97 has been closed for one week while WSDOT installs culverts. Hikers and campers have been evacuated near the fire by the Forest Service. Tuesday’s weather is expected to be cooler with a higher relative humidity and gusty winds. A chance of thunderstorms are expected. Cougar Creek Fire is burning approximately 20 miles northwest of Entiat, about 12 miles northwest of Ardenvoir and 7.5 miles of Plain, Washington. The fire was ignited by lightning. There are currently 343 personnel assigned that include 8 crews, 3 helicopters and 14 engines. There has been 42,687 acres of timber, slash ground litter and snags burned. A 78% containment status has been reached. Fire behavior has been reported as being active with short-crown runs, torching and flanking. Incident Summary | A wildfire broke out near the Pangborn Airport in Douglas County on September 1, 2018. It was said to have started on County land, one mile from East Wenatchee, Washington. Fire crews were dispatched just after 0530 hours PDT on Saturday after reports of the fire behavior being very active and burning downward towards homes, orchards and near the airport sparking evacuation notices to be issued to residents. Situation Report | As of today, the fire is estimated at 2,610 acres with no fire growth overnight. All evacuation notices have been removed along with roads being reopened. 3 Divisions are working the fire today in strengthening containment lines. Fire Fuels | Grass and brush are fire fuels. Cause | No word on the cause but it is under investigation. Resources | State Fire Mobe was approved and en route around 1100 hours PDT. Initial resources included AHTANUM 20 BLM-13 CREW-52 CREW-74 E-6695 BLM E-6696 BLM were dispatched around 0537 hours this morning. Several aircraft were ordered back to Pangborn Memorial Airport in East Wenatchee and hold. We caught these choppers at Pangborn after we left the fire incident on Saturday afternoon. One of two rotors at Pangborn Memorial Airport. Cost-to-Date | CTD has reached approximately $20,000.00. Thank you for reading and following our blog! You can also find us on our Social Media pages @nwfireblog on Twitter and Facebook. KING COUNTY, Wash. – At approximately 1602 hours PDT, Valley Com received an emergency call of a brush fire in the area of the 25000 block of 188th Avenue S.E. in Covington, Washington. The first due engine reported rapid rate of spread and threatening a home. They (1st due engine) immediately went into structure protection mode, while two other engines began putting water on the fire. After a Chief arrived, he assumed Command and ordered additional fire resources. A tender supply was established on the closest hydrant located .5 mile away. 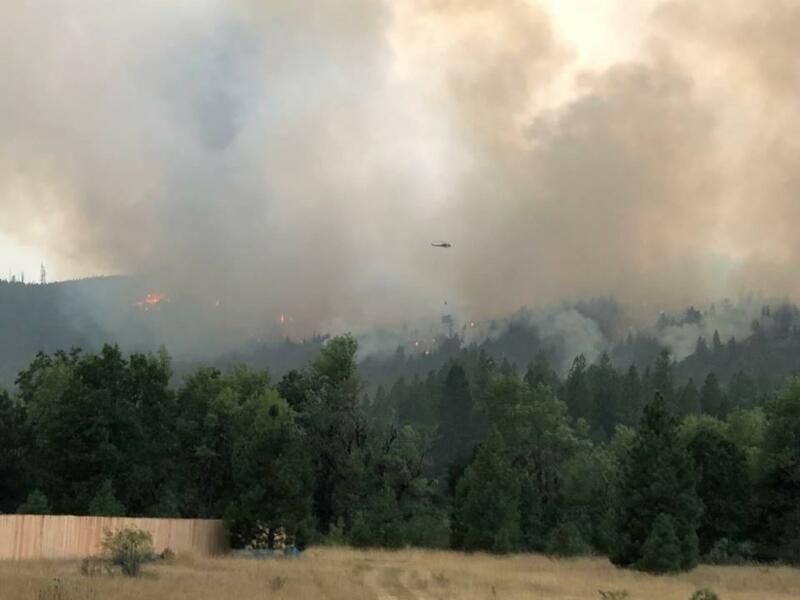 Due to poor visibility and the fire advancing towards the Highway, the Washington State Patrol shutdown the two westbound lanes for safety to drivers. A Washington State DNR helicopter responded from Olympia, was able to find a nearby pond to dip from. They began dropping water over the fire. One Social Media user reported two structures had been burned, but the official Fire presser states no homes or outbuildings were damaged. Fire crews would remain on-scene throughout the night. A dozer was on order so they could put a containment line around the fire. The fire behavior was said to be at around 2250 hours PDT, smoldering with hotspots. Incident Cooperators included personnel and equipment from the Valley Regional Fire Authority (VRFA), Mountain View Fire & Rescue, Black Diamond and Puget Sound Fire. Zone 3 Fire Explorers provided Firefighter REHAB services. The number of acres burned, containment status or cause was unknown at the time of this post. No injuries to civilians or firefighters were reported.